Here is a photo I took recently in New Orleans. 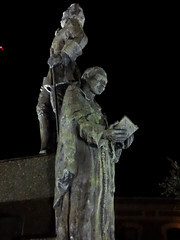 It is a statue that honors the city's founder, Jean Baptiste LeMoyne de Bienville (the figure at top). What grabbed my attention was the priest standing behind him. Symbolically offering divine approval to the colonizer, the priest is reading his Bible but does not seem to be aware of what is going on around him. This disconnect and the priest's subjugated position seem to perfectly depict problems that often occurred as religious leaders supported political colonizers.